LFE Large VLF Fan-Powered HEPA Units | Air Control, Inc. The Microvoid® Model 4RP vertical laminar flow module is an inexpensive, highly reliable unit developed by Air Control to meet the most stringent clean air requirements. 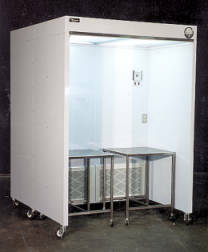 The rectangular profile makes this an ideal model for an array of applications including ceiling suspension, support by a leg frame from the floor or stacking in arrays to form a variety of clean room configurations. The model 4RP is designed with convenient controls for lighting and air velocity adjustments. Recommended for critical applications requiring a clean particle-free environment, the 4RP can be outfitted with leg stands that include liners, work decks, exhaust plenums, secondary containment and various tanks, sinks, and accessories. Standard melamine laminated mahogany and wood board construction. Alternate materials include enameled steel, polypropylene and stainless steel.